Alvin and the Chipmunks are immensely popular with kids. If parents take the time to watch these characters with their children, they will find that there are some valuable lessons to be learned and pointed out to the kids. Here are just a few that can be learned from these little critters. Come when you’re called – ALVIN!!!! 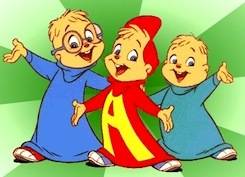 David Seville’s call is known well by anyone familiar with Alvin and the Chipmunks. David is always frustrated by the antics of Alvin, who invariably gets in trouble and never comes when summoned. All good little chipmunks and children must learn to come when called. Being smart is an admirable thing – Sometimes kids don’t like to be smart because it is considered not cool. However, Simon shows that being smart can be cool. It can solve problems and get you out of trouble too. Be loyal to your family – Now and then in some Chipmunk shows Alvin would rather pursue money and fame than stick with his family. Each time he learns the value of family. Sometimes kids need to learn that even though your family isn’t perfect like you want them to be, they are still your family. Don’t let fame and fortune get to you – Well, most kids don’t need to worry about this lesson, but even for those kids who are gifted or talented and end up in special classes or schools for the gifted. It’s good to stay grounded. Many of the Chipmunk movies deal with this dilemma. Don’t be selfish – Alvin is always going his own way and doing things he wants to do without considering his brothers or David. This usually winds up getting him in trouble, and the very people he turns his back on are the ones who help him out. Forgive those who do wrong to you – David, Simon and Theodore are always forgiving Alvin for the trouble he causes; he can cause some pretty serious trouble too. Letting kids know the significance of forgiveness is essential in character development. Consider the consequences – Alvin has a way of jumping into things without thinking them through. This usually spells trouble for the chipmunks. Kids should learn to think about the consequences of their actions before they act. Keep your sense of humor – Simon is known for his humor and dry wit. Having a sense of humor can make all kinds of situations easier to bear. Don’t let anyone talk you into doing the wrong thing – Theodore is the baby of the chipmunk brothers, and Alvin is always trying to get him to go along with his crazy schemes. Simon tries to help Theodore make the right decisions, but Alvin usually wins with a bribe of some sort. Music can bring people together – Maybe if more families sang together the world would be a happier place! The Chipmunks bring people (and chipmunks) together with their music. There’s a good lesson to be learned about finding something that the family can do together and have fun. There are plenty of lessons to be learned from these little critters and their human father. Spend some quality time with the kids and see what you can learn.